Police in Peru have seized a staggering number — 16,280 — of dried seahorses that were to be exported illegally to Asia. Three cases containing 60 pounds of the dead creatures were left behind after a police operation near the Lima airport. Northern Peru’s warmer waters are a prime breeding ground for the marine animals, which are protected under the Convention on International Trade in Endangered Species (Cites). Police chief Victor Fernandez said the seahorses could have been sold for up to $250,000 aboard, telling the BBC that, across the world last year, 20 tons of dried seahorses were seized. 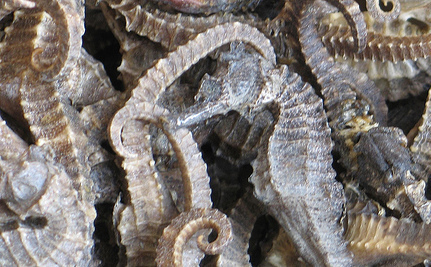 Last year, Peruvian authorities seized two tons of dried seahorses. In Peru, seahorse fishing has been illegal since 2004; those caught can receive sentences of up to two to four years in prison, says AFP (via Raw Story). “They are sent to Asian countries and used as aphrodisiacs. In China this product is also used to cure asthma,” Fernandez said. Seahorse powder sells for about $6,000 a kilogram. Seahorses are also sought after in Japan and South Korea for their alleged curative powers. Some of my older relatives, who had all emigrated from rural southern China at the start of the 20th century, used traditional Chinese medicine treatments (though I think it’s fair to say my relatives simply considered them “medicine”). We occasionally went to stores selling Chinese herbs and other treatments and I recall seeing jars with tiny curled-up forms that I saw, on closer inspection, must be (dead and dried) seahorses. A 2007 Encyclopedia Britannica article about endangered animals and tradition Chinese medicine (TCM) notes that nearly 80 percent of the world’s population relies on medicines made from plants and animals, according to the World Health Organization. In TCM, some 1,000 plant and 36 animal species are used, including the black bear, musk deer, sea horse, tiger and rhinoceros, the last two being endangered animals. Thirty-two countries and regions are involved in harvesting some 20,000,000 seahorses each year; yet production already is failing to meet a worldwide demand that had reached 500 tons annually by the beginning of the 21st century. China’s demand alone was 200 – 250 tons per year, 95 percent of which had to be imported. The rising demand, according to the World Nature Foundation, had resulted, already in 1996, in the reduction of populations of the known 35 varieties of seahorses by more than half. It it not yet known if seahorses are endangered. Efforts to farm the animals have not been successful in the past so fishing wild seahorses continues. An organization called Project Seahorse seeks to protect seahorses from being illegally fished and also to preserve their habitats. They are not only illegally caught but stripped from the sea by the nets of shrimp trawlers and pollution, dredging, mining and other human activities are damaging their inshore coastal habitats. Seahorses are important predators in marine ecosystems and need to be protected the ensure the future health of our oceans and all the incredible varieties of animals who call it their home. What Does the Future Hold for Seahorses? So sad!! There's always somenoe looking for profit!!! 2-4 years for killing off an endangered species? I think they should be hung out to dry like human jerky just like the animals they've killed. Poach the poachers already. Get on it already. We need wildlife, we don't need no friggin' poachers. "So what is America going to do with all the wild horses it has rounded up to keep America's public lands available for cattle and sheep? How is the BLM going to continue to justify the continuing costs of keeping the horses penned or pastured? The concern, for wild horse lovers, isn't just that no one in Washington seems to have a good answer to those questions. The concern is that when the answers finally do come from government they'll come from folks like Hendrickson, who evidently believe that large-scale slaughter is a valid option." and would wholeheartedly support any international laws of this sort. With 45,000 or so wild horses in federal control, the Bureau of Land Management selects a "pro-slaughter cattlewoman" to be the public's voice on its advisory board. If "we" had "our" way, we'd have a lot more REAL horsemeat on the menu. Just remember that next time you want to lambast "Asians" for eating seahorses. Asian countries, mentally and morally deficient??? Hello Marc D. - 3 fingers pointing back at ya! You don't see any Asian youth going crazy and attacking public places with a gun - oh yeah, guns are illegal in most Asian countries - certainly China. Another example of their mental deficiency. Oh yeah, and then don't forget about they're mentally deficient math scores that blow U.S. students out of the water. In Thailand the annual murder rate is less than 10 people a year (last time I checked). It's ridiculously low everywhere else in Asia too. In Thailand, rather than requiring youth to join the army for 2 years they must become monks for a time. Moral deficiency? Comments on this page seem somewhat "mentally and morally deficient", however I will grant the article rather encites outrage. I also don't like some of the Chinese traditional medicinal use of animals - the majority of Chinese medicine though involves plants and herbs. Though it's true, a sector of the Asian population will eat and use anything in the animal kingdom for food or medicine and there is an over-indulgent interest in "strange animal foods" in some circles, it has long been this way. Be that as it may, unless one is a vegetarian him/herself it doesn't seem to me one has a great right to criticize others for their own brand of meat consumption, however off-putting, cruel and/or disgusting it may seem. Most modern Asian countries are disgusting since they are so mentally and morally deficient. They are a real threat to the earth since they certainly don't have a culture, they operate only on pure, criminal, immoral greed.